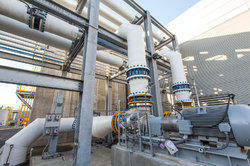 Prominent & Leading Manufacturer from Chennai, we offer desalination plant. Desalination Plants are widely used for purifying the sea water to make it useful for domestic and industrial applications. We offer customization of these plants according to the specifications of the clients. These are manufactured using premium quality materials and in our advanced and well-equipped manufacturing unit. These are accessed by our clients at affordable prices in the market.